Hello, fellow Mizzou crafters, DIY-ers and creativity seekers! All you wonderful readers will have the pleasure of joining me (and some special guests on occasion) on our crafting adventures. I thought I would start off with the tried-and-true classic DIY: tie-dyeing. My fellow crafting friends and I went to a free "Crafternoon" at the Craft Studio in the north tower of Memorial Union’s basement on September 7 for their free tie-dye craft. Each Friday, they have a different free craft from 12-4 p.m. for anyone to come do, which perfect for us fun-hungry, broke, college kids. They have all of the supplies, except for the tie-dyeing you had to supply your own shirts (or, in my case, white sports bras). After we signed in and they gave us some simple instructions, we grabbed our rubber bands, t-shirts and sports bras and went to work. Pinch any spot on the garment (I chose the center) and start a twisting, twirling motion to create the spiral pattern. 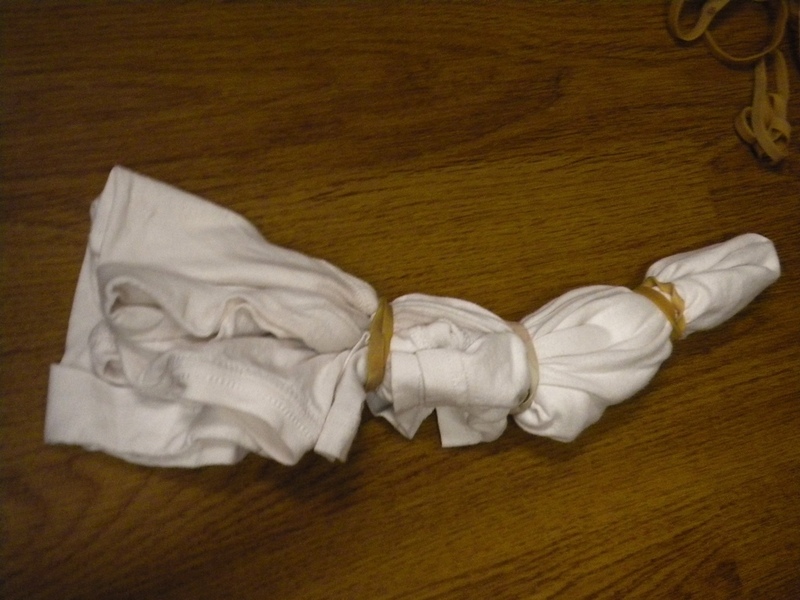 First, you have to decide what kind of tie-dye pattern you want based on the rubber band method you use. 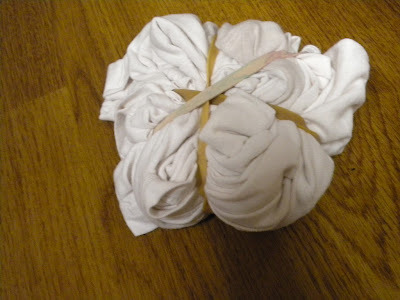 There is the classic spiral, which I used for both my sports bras, where you pinch an area of the clothing you are tie-dyeing and twirl the fabric around itself until it looks like a spiral of cloth. 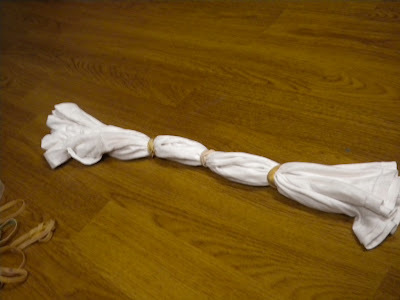 You then carefully hold the spiral in place as you wrap the rubber bands around the fabric, overlapping them, making your clothing look like a pinwheel. 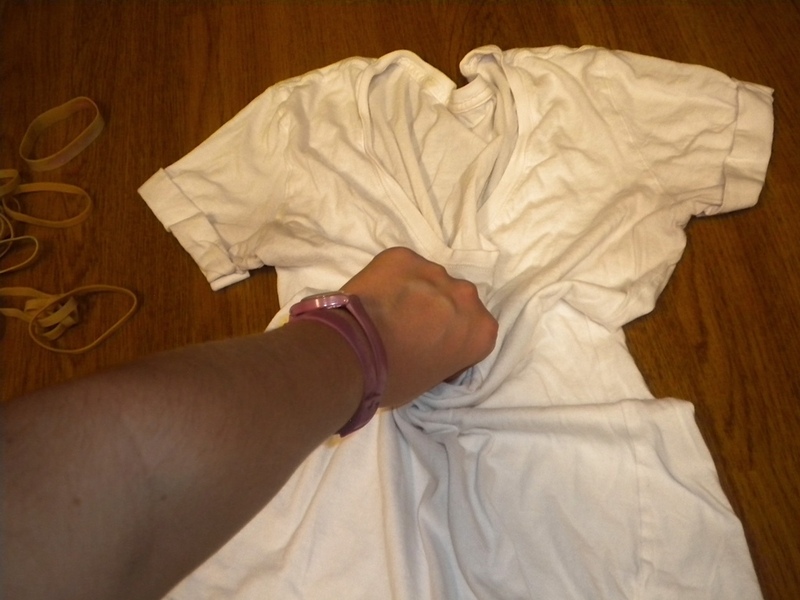 Keep up with this spin-of-the-wrist motion until the garment is spiraling completely around itself. Hold the spiral in place and put the rubber bands criss-crossing each other to create sections to dye different colors in your spiral pattern. Aside from the spiral method, there are a few other options to consider. One is a bullseye method, in which you pinch the fabric, just like the spiral, but then you hold the fabric from that pinched point and wrap rubber bands down the tube of fabric, creating a t-shirt sausage of sorts. For the bullseye pattern, pinch and pick up the garment from any area that you want to be the center of your bullseye. Wrap rubber bands down the garment with the area you originally pinched being the top. You also could do a stripe style, where you wrap rubber bands down the length of the shirt, forming sections of the shirt that will make tie-dye stripes. 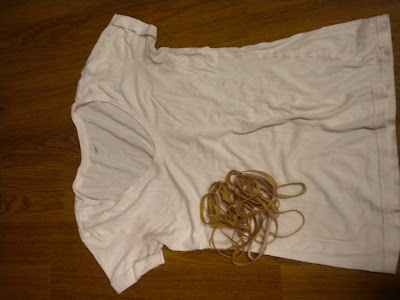 To create the stripes, take the garment from its regular, flat state and gather it vertically or horizontally, depending on what direction you want the stripes to go, so that it is easier to wrap rubber bands around it. 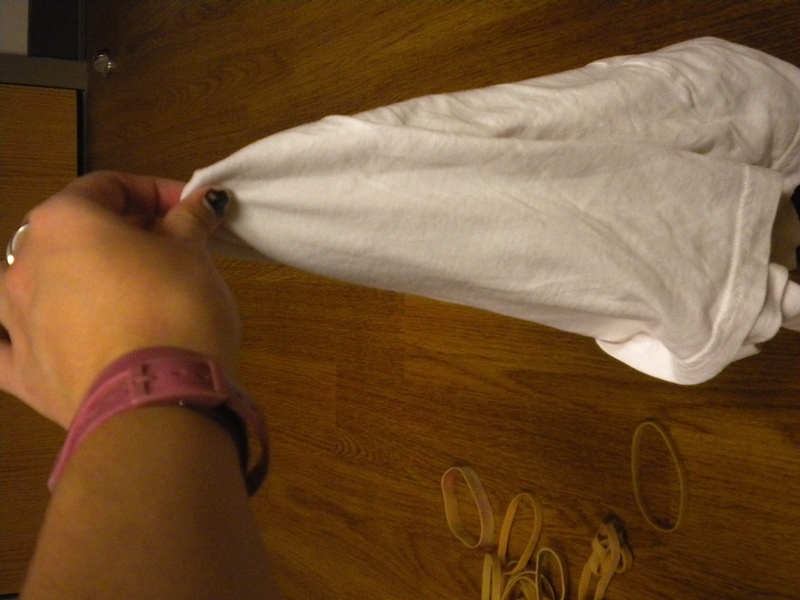 Simply wrap rubber bands down the garment, distancing them as much or as little as you want depending on how big you want your stripes to be. This sort of method is great for creating an ombre effect with increasingly darker or lighter colors. 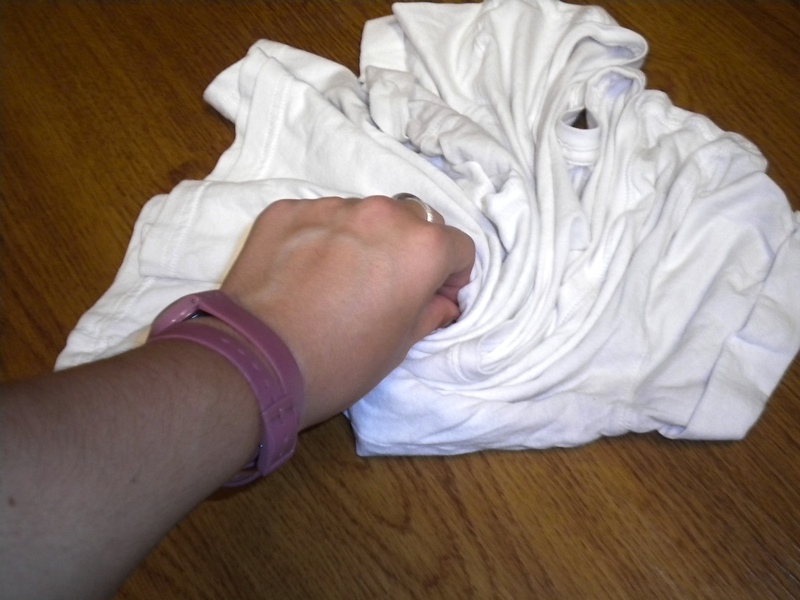 After you have rubber banded your clothing, you have to soak your items in a dye fixer solution. This stuff will come with your tie-dying kit if you purchase one, or you can find some at a craft store. The rule of thumb is ¾ cup of fixer per gallon of water. You only need to let it sit for about five minutes to let it work its magic. Pull your clothes out of the fixer solution, and now it is time for the fun part: the “dye” in “tie-dyeing.” The Craft Studio had the dyes made for us in squirt bottles, which is the most efficient way to tie dye because then you can pinpoint exact areas to color. The goal is to not get too much dye so that it bleeds through and makes a mess of your shirt, but you want to saturate the area with color so that when it is washed it will retain that color. Putting the little tip of the squirt bottle into all the nooks, crannies and folds of the fabric and flipping it over to get both sides usually gets the job done well. Also, it is best to put light colors on first and then add dark colors. Colors that are complementary, i.e. opposite on that color wheel that you should remember from second grade, will create a gross, brown color when put next to each other in the garment. Put colors that are adjacent to each other on the color wheel, like blue and purple, next to each other on the garment to create the best color combinations. After you have thoroughly tie-dyed your clothes (and most likely your hands), you can wrap your clothes up in a plastic bag, making sure that it is airtight, and let them sit for 24 hours (48 hours is even better - the longer the better). Once the wait is up, you can unwrap the clothes from their bags and rubber bands and rinse them in cold water in the sink. Rinse until the water runs clear. Then, you can put all your tie-dyed items in the washer on cool or warm with some detergent, and then put them on the normal setting in the dryer (and pray that the dryer will actually work for you ... darn you, dorm laundry rooms!). Voila! You now have some fabulous tie-dyed garments just waiting to add some 60s boho vibe to any outfit. If you want to steal my tie-dyed sports bra idea, you can’t have it ... just kidding! However, I’d suggest you buy cotton sports bras, not those crazy, dry-fit fabric ones, or else your dye will all rinse out and leave you with a sports bra the color of pee, pit stains and make-up instead of the gorgeous yellow and olive green it was supposed to be. In other words, it will be a tie-dye-saster! Other out of the ordinary things to dye are socks and cotton sheets (for those few hours of sleep you get after studying all night). If you don’t want to go out and buy tie-dye stuff, get a large group of people from your dorm, sorority, organization, whatever, and contact the Craft Studio. They will come to you with all their tie-dyeing goodness so you can enjoy some MIZ-DIY. I don't understand what do want your own shirt? well i am using bali cotton bras its really comfortable bras. 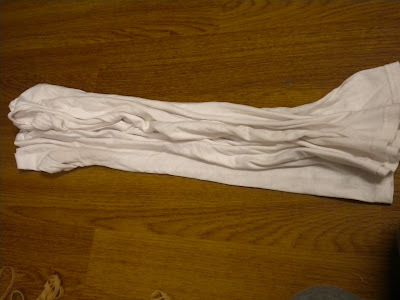 its a Tie-Dye Clothes on white shirt. its looks amazing. Amazing color combination for Tie-Dye. Its a great fit at a great price. The straps how ever feel a bit rough to me , one gets accustomed too that gradually but if the straps could be made smoother the experience will be better. I love bali 3036. ذا در این بخش از سری مقالات استخدام مشاغل گوناگون امروز به موضوع اشتغال در حوزه تجهیزات گرمایشی منازل خواهیم پرداخت؛ با استخدام نیوز همراه باشید. در زمان های گذشته برای گرمایش تولید از موتورخانه هایی استفاده می کردند که هزینه های بسیار سیستم گرمایشی دارند از پکیج دیواری استفاده می کنند که کارایی بسیار بالایی برای فضای داخلی خانه دارند.